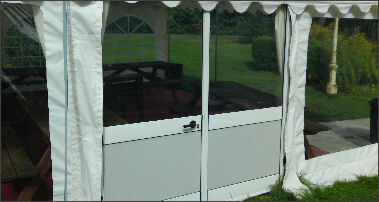 Marquee solid frame doors are specifically designed for our premier range of Portland Marquees. Both doors open, one with handles (keys included) and one with fixed latches top and bottom. DIY Marquee solid frame doors are specifically designed for our commercial range of DIY Marquees. Both doors open, one with handles (keys included) and one with fixed latches top and bottom. Ideal for creating formal entrances or for keeping heat in during winter functions.